I took my wife to Sonoma, CA for the weekend in celebration of her 40th birthday. It was also our 5th wedding anniversary. So it all came together quite nicely. We invited 15 of our friends to a beautiful and large home called Artisan House on the Russian River. It was truly a great weekend of fun and laughs. With a hot tub. In a small amount of spare time, I baked pie 43, a cherry pie with a lattice top. Thaw one of your ready-made pie crusts. You’ll cut that for your lattice. Mix cherries, flour, cinnamon and sugar into a large mixing bowl. Pour into your frozen pie shell. Flatten your thawed pie crust. Cut lattice from your thawed crust and weave on top of the pie. Pinch the edges to the shell. Bake at 425F, for 30 minutes. Reduce heat to 350F and bake an extra 25-30 minutes or until crust is light brown. It was really tasty and had a nice hint of the cinnamon. It was also quite juicy and sweet. Just like our weekend! All of our friends who tried it really liked it too. 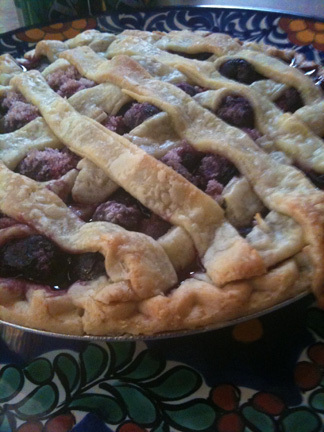 This entry was posted in Cherry Pies and tagged Baking, Cherry Pies, Dessert, Pie, Recipe by pieofthebeholder. Bookmark the permalink.